Apple’s hot addition in its latest iPhone lineup is the 3D Touch that serves as a new interactive layer in the display. The introduction of 3D Touch added a new control layer that varies according to the amount of pressure you apply to the display. According to a new patent filed by Apple, the company plans to extend their technology to the Touch ID or Home button of their iOS devices. The inclusion would further open new dimensions by which you can do more than you can now. The patent was filed with the USPTO under the title ‘Force-Sensitive Fingerprint Sensing Input’. 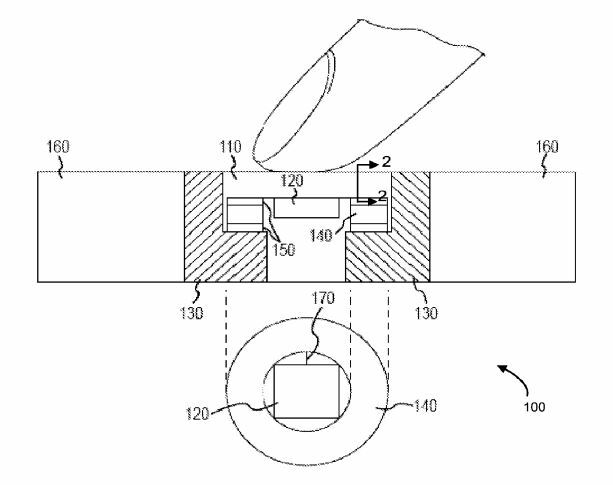 The patent declares a new method by which Apple’s 3D Touch-like internals will be fitted under the Touch ID. Currently, the Touch ID of Apple’s iOS devices is fitted with a highly accurate fingerprint scanner which is covered by a thin wafer of sapphire. The Touch ID components are housed in a capacitive sensing ring that starts a scan operation which it is touched. Touch ID of Apple’s current iOS devices serves quite a handful of purposes, ranging from unlocking the device to making payments using Apple Pay. Moreover, it also triggers multi-tasking via a double-click and can be further used to access the Home screen. However, the future of Touch ID might have even more controls for us, igniting various functions at various occasions. For instance, the pressure-sensitive Touch ID can be used to launch the camera app as a shortcut or assigning shortcuts to other apps. There can be many other functions nestled in the pressure-sensitive Touch ID. Apple’s plan to implement the pressure-sensitive Touch ID will be pretty similar to 3D Touch. The company proposes using a capacitance sensor underneath the Touch ID button, which will ultimately register pressure the same way as Apple’s 3D Touch on iPhone 6s and 6s Plus. User’s operation will be registered after the electrodes between its surface are narrowed together, highlighting that a force has been applied to the Touch ID. The pressure-sensitive Touch ID could enable quite a handful of new gestures on various iOS devices. It could also be true that Apple is planning on eliminating the Home button and integrating Touch ID within the display. Hence, the force applied to the Touch ID could ultimately react the same way as the Home button. However, nothing can be said for sure at this point, since it’s just one of the many patents that Apple files every now and then. What are your thoughts on the matter? When do you think will Apple implement the pressure-sensitive Touch ID on its iOS devices? Share your thoughts in the comments.